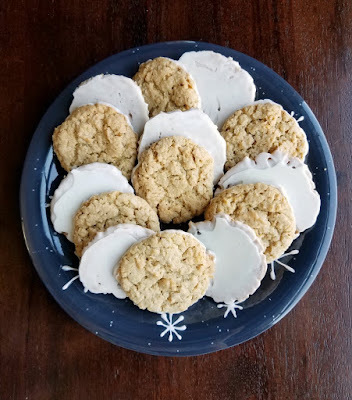 Frostbite cookies are the perfect combination of everything you'd want in a cookie. They have just a hint of peppermint, and that sweet buttery cross between being crunchy and melt in your mouth. It is time to dust off those baking pans and get out the cooling racks, Christmas cookie baking season is officially here. 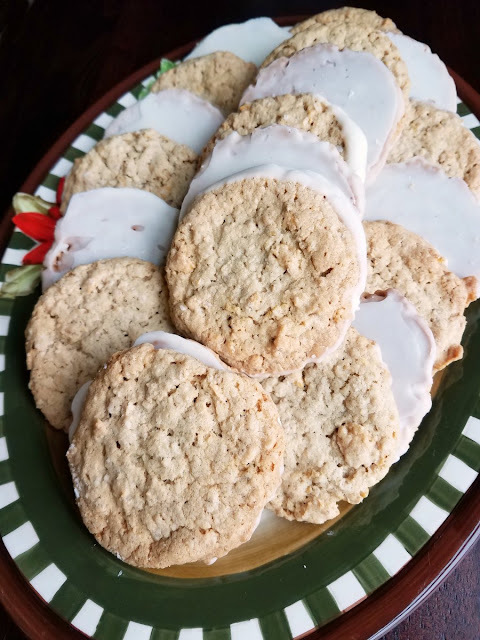 We are celebrating all things Christmas cookies this week and I am kicking it off with the delicious frostbite cookies. They are sweet and butter with that perfect combination of crunch and melt in your mouth goodness. When I signed up to participate in a week devoted to #Christmascookies, I knew exactly where to go for inspiration. My friend Kris at Big Rigs 'n Lil' Cookies has cookies right in her blog name! I actually didn't even have to dig very far, I have had her frostbite cookies pinned to one of my must make boards for way too long now. So I jumped at this excuse to get down to business and make them! As these things go, I did make a few very small changes. One was to bake the peppermint extract right into the cookies. Kris added her hint of peppermint in the almond bark. Now don't let the peppermint deter you if you aren't too sure about adding it. As written, the recipe just adds the lightest touch of peppermint flavor. In fact, not one person detected it strongly enough to even ask if there was peppermint in them. It just adds that little something special that is barely detectable but really adds to the overall taste nonetheless. If you are a bit peppermint fan, I suggest you increase the amount you add slightly. Just go slow as peppermint is one of those flavors that can easily go from good to overpowering if you don't pay attention. Of course using a good extract always makes things taste better. 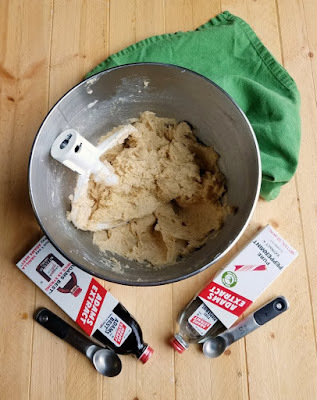 Adams Extract sent me some fabulous vanilla extract and peppermint extract to create these fun cookies with. They also sent along some natural food coloring that I can't wait to play with! I found flattening the cookies wasn't really necessary. I tried a few different variations of how to shape the balls before baking and really the differences were minimal, so I'd go with the easiest which is the good old scoop, plop and bake method. I did use my medium cookie scoop to make these cookies. This made nice large cookies that disappeared quickly at a recent party we hosted. If you would like smaller cookies for your holiday trays, I am sure the small scoop would work well. Just take a minute or two off the bake time and watch them until you see how long they take. 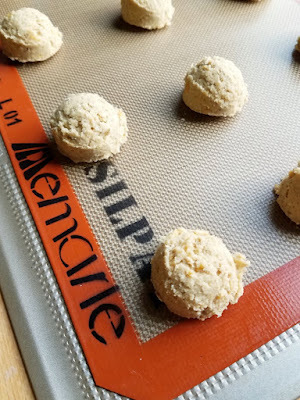 To keep the cookies from sticking to my baking sheets, I used my new silicone baking mat from Silpat. Don't skip dipping the cookies in the almond bark. While they would be delicious without it, that really adds that something special that Christmas cookie should have. So go ahead and go the whole way and make them fabulous! Don't forget to check out the other cookie recipes, there is going to be a lot of great variety over the course of the week. I'm sharing a fun twist on a classic (and super simple) dipped sandwich cookie tomorrow, so be sure to stay tuned. Beat together butter, sugar and brown sugar until light and fluffy. Mix in eggs, vanilla and peppermint extract. In a bowl, whisk together flour, baking soda, baking powder and salt until combined and lump free. Mix flour mixture into butter mixture until just combined, don't over work. Stir in rolled oats and cornflakes until uniform. Cover and chill for an hour or overnight. 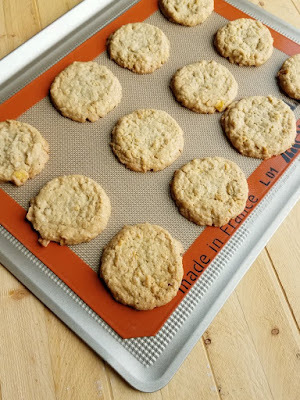 Preheat oven to 325 F. Line cookie sheets with silicone baking mats. Scoop a rounded Tablespoon of dough onto the lined baking sheet, leaving at least 2 inches between cookies. I like using my medium cookie scoop to make this easy. Bake for 13-15 minutes or until lightly golden brown. Cool for 5 minutes on the cookie sheet and then remove to cooling rack to cool completely. When ready, gently melt almond bark either in a double boiler or using short bursts in the microwave. Stir in the shortening, then dip the cookies. Place on wax paper to set. Store in an airtight container at room temperature for up to a week or freeze until ready to use. Eeek so excited for cookie week. These look absolutely scrumptious and I love the name. Happy Monday sweet friend! Thank you so much and buckle up for a sweet few weeks! These sound awesome! I love peppermint anything so I know I'd love these! These really are so fun with that almond bark coating the bottom- such a great cookie for the cookie tray! Thank you, they were definitely a hit with our gang! Yum!! I've not thought to try a peppermint butter cookie. I am adding these to my holiday party menu! I almost dipped half, but am glad I went this route too! What a cute name and delicious concept! I love the idea of dipping the bottoms!! As if these weren't good enough...their bottoms just make them too good to pass up! That's what I call a real Christmas Cookie Bonus! These cookies are a double dose of delicious! The almond bark is a yummy unexpected surprise! It definitely takes them to the next level! Yay! Thanks for sharing the recipe, we really enjoyed them! What a great looking cookie-I love the combination of corn flakes and oatmeal and of course pepperminut-yum! Italian Cookies are my favorite one to make especially for the holidays. This recipe will be a fantastic one to add to my cookie trays this year! These cookies sound wonderful! The frostbite name is too cute. I am not a huge peppermint person either so just a hint sounds perfect! It's just enough without being overpowering! These cookies look so yummy! I love that you used oatmeal and cornflakes, and the white chocolate dipped bottoms are perfect! 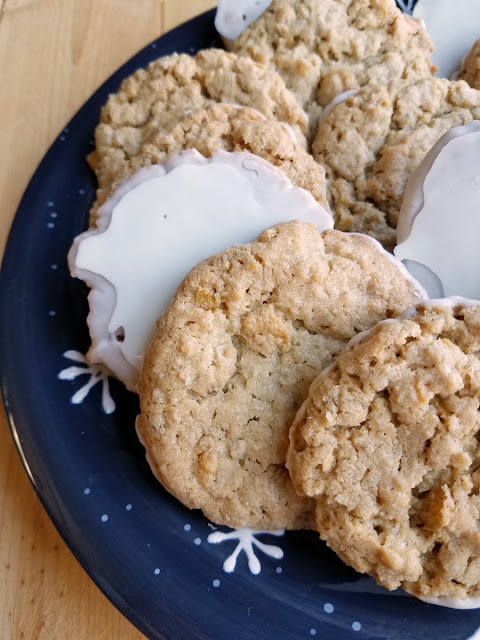 I love the name "Frostbite Cookies" and this recipe sounds delicious. I like mint so these sound like a keeper. I've used wheaties in cookies but never corn flakes, hmmm. Almond bark sounds like a great idea! Now I need to use wheaties! Oh Carlee, I had kind of forgotten these cookies existed. Thanks for reminding me - they're soooo good, with that nice thick layer of almond bark at the bottom. I need to make them again, and soon! Hi Carlee, I like the sound of these cookies, I may just have to give them a try! I use creme de menthe instead of peppermint essence (peppermint essence isn't so easy to get here). Do you think that would make a difference? I would think that would work. Let me know if you give it a try! I love making big, soft sugar cookies. Sounds like the perfect cookie. All I need now is a big glass of milk. Mmmm...almond bark on a cookie? I'm not sure there's a better cookie. A great after dinner treat. It is a fun way to dress them up for sure. These will be very special cookies, I just love frosted cookies! Hope you are enjoying your week and thanks so much for sharing with us at Full Plate Thursday! i like classic chocolate chip cookies. They are a classic for good reason!